This is post #19 in an ongoing series of articles about my work as a poker bot developer. When I first attempted to build a poker bot, I tried long and hard to come up with a single algorithm that given your two hole cards and the situation would spit out call, raise, or fold for every situation that the bot could face. Turns out its not a trivial task. 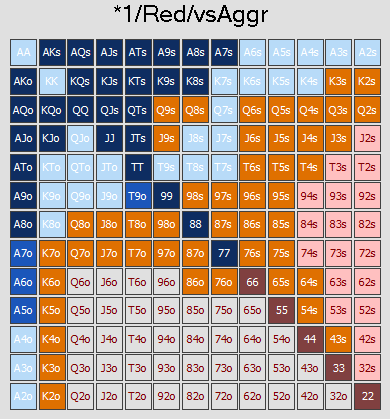 There are a lot of factors that should affect your decision: your hole cards, your image, your opponent’s style, your position, the stack sizes relative to the blinds, the recent hand history, the stack to pot ratio once the flop hits and, and the history so far in the hand (in the case of three and four bets). To quantify all of this information – let alone weigh it in an intelligent way – is difficult, to say the least. After several weeks of fruitless attempts, I abandoned it in favor of a simpler, albeit less elegant solution. It would be impossible to enumerate every possible combination this way, but if you take some shortcuts, you reduce it to a manageable number of factors. All previous actions are reduced to C (call) or R (raise) and the size of the raises are ignored completely. Every preflop decision can be represented this way. It’s generally not a good idea to group holecards beyond the standard 9s 9h = 99, 9s 8h = 98o, etc. There are times when 88, 99, and TT should be treated the same and other times when TT should be treated differently, so it won’t do you much good to create a “Mid Pocket Pair” group and treat everything in it the same way. There are two versions of Range Maker shown in the screenshot above. Below the grid on the left is the older version; on the left is newer version. The grid serves both. 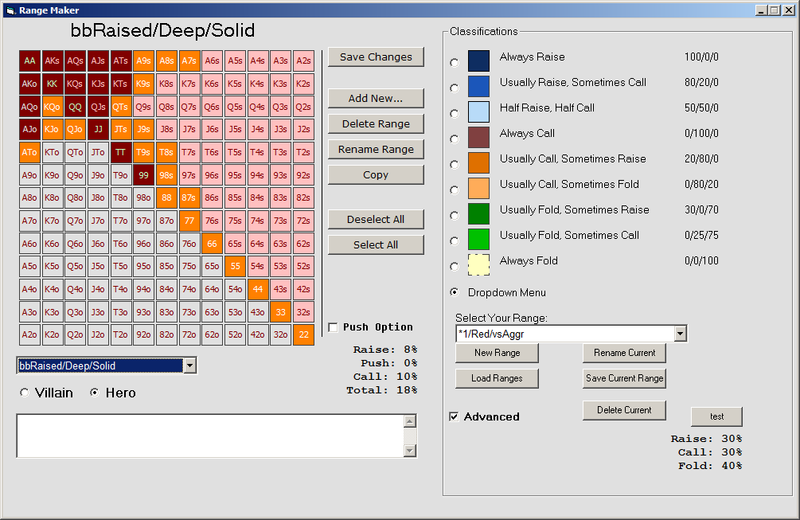 The older version lets me assign a fold, call, raise, or push action to every hole card combination in the selected range. 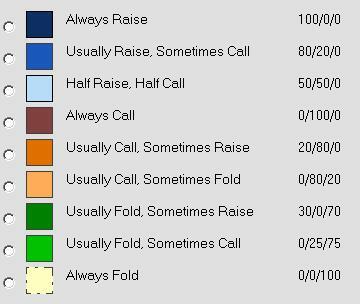 The numbers on the right represent the distribution of raise/call/fold for that color. The randomness was necessary to fool observant opponents and PokerStars security, in case that was something they looked at. The decision to push or raise 3x was later delegated to software, which figured out what the stack to pot ratio would be postflop if the opponent called and pushed if it was too high. It took a long time to get these ranges down. I would sit there and watch the bot play for hours, making pages of notes on what I wanted to adjust when the session was over. These include virtually every range I ever worked with, so if you want to use these you’ll have to spend some time analyzing them to pick out the gems. 1. Analyze the current situation: hole cards, stack size, previous action, and opponent style and group them. Example: PokerStars 25/50 blinds, you are small blind with 2100 chips, call station opponent is big blind with 900 and you’re dealt Ks 5h. Your effective size is 900/50 = 18 big blinds, putting you in the red zone and since you’re small blind and first to act, the previous action is simply “1”. Now with three layers of conditional statements (stack size, previous action, and opponent style) you can look up the range (see the screenshot above) and determine that K5o is 80% raise, 20% call, and 0% fold. Roll a die (in this case the random number generator) and pick an action based on that distribution. 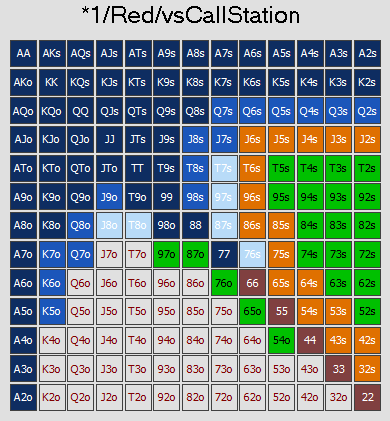 sRangeFile_Old = App.Path & "ResourcesHero Ranges.ini"
sRangeFile_New = App.Path & "ResourcesHero Advanced.txt"
This approach covered about 90% of all the preflop situations the bot faced in the course of a game, but about 10% had to be handled with special cases. Consider, for example, an opponent who pushes every time with 75bb. You can’t just treat this as a 2R situation and call with the standard range. There are also a lot of situations where you should shove simply based on its expected value, which you have to figure out in spots that warrant it (which require you to estimate your opponent’s raising and calling range). If you’re an aspiring botter and have questions about any of this, feel free to shoot me an email. And good luck.